1.200mg per 240ml - ALA omega 3. 100% plantbased. Free from milk, lactose, gluten and soya.Are you? OOOMEGA® Omega 3 & Omega 6 100% plantbased flax drink...and delicious tasting! 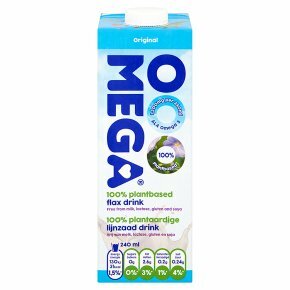 OOOMEGA plantbased flax drink is a delicious tasting dairy free drink made with flaxseed oil, known to be own of the richest plant based sources of Omega-3. Omega-3 is a group of essential fatty acids that can be beneficial to health. The body can not easily convert other nutrients into Omega 3 and therefore it is recommended that they are included as part of a healthy, balanced diet. OOOMEGA Dairy free flax drink is cholesterol free and suitable for those with lactose intolerance. It is an excellent source of plant based Omega-3 for vegetarians and vegans.